Home » In the News » Congratulations Tim! Congratulations to our fourth year extern, Tim Kuckuk. 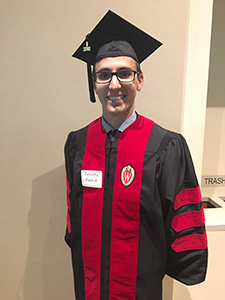 He graduated from UW-Madison with a Doctor of Audiology (AuD) on May 11, 2018. Him's kindness and dedication to audiology and his patients will take him to great places in his career. We will miss him greatly but wish him the best of luck and happiness.